Professional Development | A . T . T . N ! Make learning visible. Tell your learning story. Find out how at the next T4TL workshop. 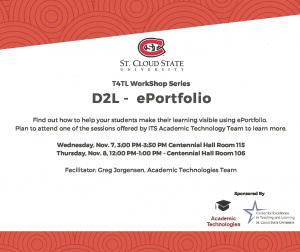 This week we will be hosting another Technology for Teaching and Learning (T4TL) workshop: D2L ePortfolio. Plan to attend one of the sessions offered by the ITS Academic Technology Team on either Wednesday, November 7 from 3-3:50 in Centennial Hall 115 or Thursday, November 8 from noon to 1 in Centennial Hall 106. If you can’t join us in person, please plan to join us online at: https://webmeeting.minnstate.edu/t4tlworkshops. We look forward to your attendance. Wednesday, Feb. 28 from noon- 1 in CH 106 OR Thursday, Mar. 1 from 3:30 – 4:30 in CH 106 OR use this link to join us remotely T4TL remote access. Would you like to reach more students with the same email message, but you want it to feel more personal? Are you curious to know what other faculty are doing in the classroom with technology? 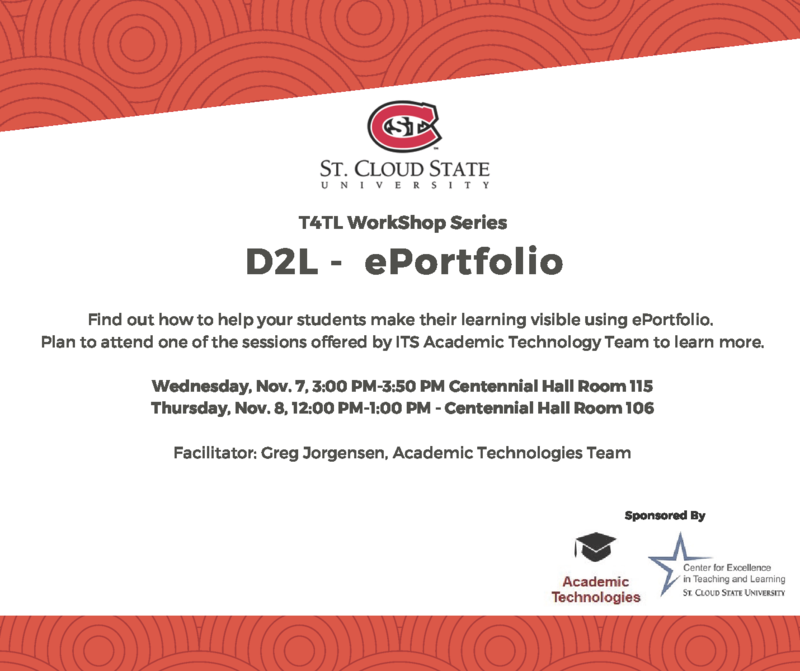 Join the Technology for Teaching and Learning (T4TL) workshop to learn more about instructional technology tools. 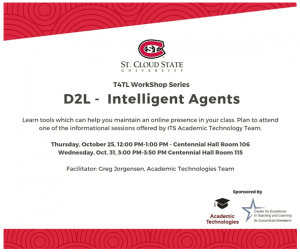 Wednesday join Dr. Mark Petzold to hear more about how he uses D2L Intelligent Agents to reach out to his students without needing to create individual emails. Thursday join Dr. Kannan Sivaprakasam to hear how he is using instructional technology tools like Respondus, LICEcap, Zoomit, and Clickers to engage his students in Chemistry. We would love to see you in person, but if that is not convenient, please join us remotely to learn more.